Master Officer Tony Mann, an Indiana Conservation Officer with the Department of Natural Resources’ Division of Law Enforcement, has been selected as National Wildlife Turkey Federation Wildlife Officer of the Year for the state of Indiana. The federation’s considerations in choosing an award-winner include the full-time law enforcement officer’s case involvement, public relations outreach, and service to the community. Mann serves as a defensive tactics instructor, a National Archery in the Schools Program instructor, and tree-stand accident investigator. 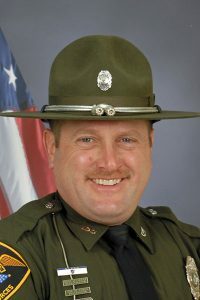 Mann began his career as an Indiana Conservation Officer in 1990, when he was assigned to Boone County, northwest of Indianapolis. Since 1997, the Loogootee resident and Dubois County native has served District 7, where he is assigned to Martin and Dubois counties. Considered the division’s expert on tree-stand safety, he reviews and documents all tree-stand accidents and has done several public service announcements in the last few years on the topic. He also makes frequent personal appearances for DNR Law Enforcement, including Jakes Day events for the National Wildlife Turkey Federation. Mann is now eligible for the federation’s National Wildlife Officer of the Year Award, which will be selected Feb. 16 at the National Wildlife Turkey Federation Convention and Sport Show in Nashville, Tennessee. Be the first to comment on "Local Conservation Officer Mann Bestowed With Wildlife Officer of the Year Award"